Dimensions 0 by 9.06 by 6.10 in. Amazon.com description: Product Description: This volume compiles essays from different disciplines on developing an expanded notion of the text. Questioning the meaning and function of textuality leads to the suspension of the traditional operational dichotomy between philosophy and philology, heightens sensitivity to different forms of linguistic-aesthetic presentation, explores new practices of reading, and reflects on their epistemological implications. 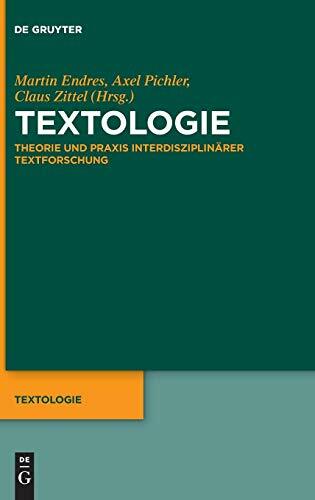 With Axel Pichler (other contributor), Martin Endres (other contributor) | from Walter De Gruyter Inc (October 30, 2017); titled "Textologie: Theorie Und Praxis Eines Neuen Ansatzes InterdisziplinÃ¤rer Textforschung"
About: This volume compiles essays from different disciplines on developing an expanded notion of the text.